Moldering texts tell of a coastal necropolis rich in ancient treasures, including the Ruby Ring, the last artifact of a daring thief who stole from Queen Huehaatl's legandary vault of riches and took the secret of his feat with him to death. The Wizards of the Four Winds task you to journey to distant shores and cut your way through sweltering jungles to uncover the fabled riches of Queen Huehaatl. 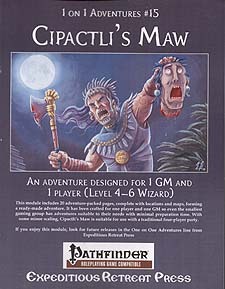 Do you have skills and sorcery to survive Cipactli's Maw?